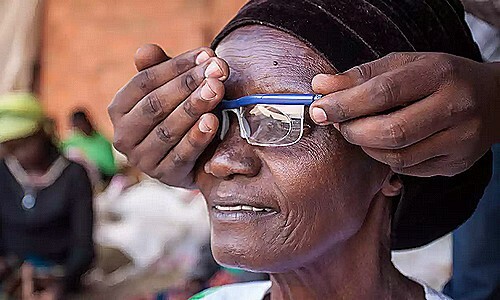 Rwanda has become the first poor country capable of providing eye care to the entire population. At least one-third of the latter have showed need of a treatment and specialized nurses have visited the inhabitants of all 15,000 villages within a health program that will literally change their lives. Because everything now fits, every fragment of the picture, the most unfair too, it will find meaning. Because when the poor see better, they don’t fall into the trap again. Avoiding the usual hole, they jump over the typical trip and the fraud will have to do something else to bring home the booty. Then, sooner or later he will commit the mistake that will condemn him, and the poor will see it, you can bet on it. In fact, when the poor see for the first time, they no longer lose precious time in words and gestures without basis. The eyes become witnesses, they build memory, defining precisely the past and the present, pointing at the future with the concreteness it deserves. Consequently, from that moment, words and gestures will be different and many will notice it. For this reason, when the poor see, it suddenly happens they look at each other. Therefore they start to count and understand each other in the right light, stopping the action that’s necessary for everyone but them. Imagine that scene paused, freezing this abstruseness for the last, definitive time. Incoming fade: brother hitting brother, while behind the two the true thief of the world flees with the stolen goods taken away from their home, to stand up later as a bulwark of the loot. When the poor see… us.